January is just as harsh for wildlife as December so make sure you continue feeding the birds and providing water. At this time of year, birds become bolder, venturing into gardens in search of scattered scraps and well-stocked feeders and bird tables. Fallen apples can still be a good food source, which you can supplement with sliced fruit from the kitchen. You may be lucky enough to see more unusual visitors, such as fieldfares and redwings looking for berries and fruit in cold winter weather. If you walk through woodland at this time of year you might hear a woodpecker hammering on dead wood, hunting out insect larvae in the bark. If you see a flash of red it's likely to be a great spotted woodpecker. These attractive birds may venture into larger urban gardens, especially if you leave dead wood or provide a peanut feeder. Winter thrushes can be seen rummaging through the leaf litter and flocks of Siskins and Goldfinches can be found feeding in the Alder trees alongside the brook on Riverside Walk to the rear of Morrisons. Insects are few and far between in January. But a few active species can be seen on winter days, of which the most conspicuous are the gently dancing swarms of harmless Winter Gnats. In the winter sunshine swarms of male gnats make an appearance. If you see a dull brown gnat in winter, it will almost certainly be one of these. Cold doesn’t worry them – two of our common species fly at 0°C and can still walk about in sub-zero temperatures. Females even get on with laying eggs under snow, although males do need it a little warmer for swarming. 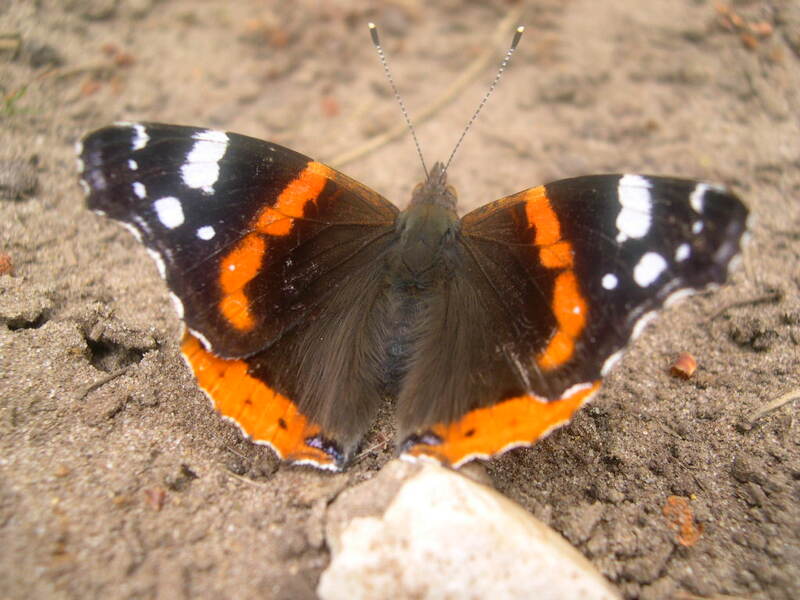 On a warm sunny afternoon in late January Red Admirals may come out of hibernation. As the tree canopy is gradually lost Grey Squirrels can be seen moving through the branches looking for acorns. January is really a low point in terms of plant hunting. However there are some signs of things to come as Cuckoo Pint leaves are starting to emerge in a curled funnel formation, Lesser Celandine can also be found in flower. The first of the Hazel catkins are starting to appear. Very few of our land snails are active in temperatures below freezing and the first frosts will see snails bedding down for winter. When your body is mainly water, one of the most important things to do is protect yourself against the cold – ice crystals in the body could be lethal. So snails use their multi-purpose mucus to literally close the door on winter. Snails make a dried lid of slime over the shell mouth, which seals in the snail for several months. They find suitable nooks and crannies in walls, under stones or deep in leaf-litter where frost won’t penetrate before sealing themselves in. Often several snails will hibernate together in favoured places, very occasionally emerging on the mildest of days.